These holiday gift ideas for women are good year-round, no matter what the holiday or the nature of your wrongdoing. We've included some inexpensive, mid-priced and costly items for all categories, so no matter what your budget, you can find something on this list to fit her tastes and your circumstances. What It Is: A piece of fabric wrapped or sewn in a cylindrical shape, worn around the waist. Why It's Such a Great Gift: Though not the best winter gift, in the summertime a nice skirt serves as a great way to look stylish and flirty without being slutty. Possible Recipients: Femmes, Young Ladies, Ed Wood. Impossible Recipients: Stone Butches, Debra Morgan. What It Is: A book full of photographs of clothes, models wearing makeup, shoes etc. Why It's Such a Great Gift: It gives your recipient something to do (read the book) after all the presents are unwrapped. Possible Recipients: Women who love costume dramas, high resolution sartorial photographs and flights of fancy; makeup artists, fashion designers, seamstresses and armchair costume historians. Impossible Recipients: Women who don't want any more books; blind people. What It Is: Gels, soaps, powders and oils which can be put into a bath and make it bubbly. Possible Recipients: Women with little or no time to themselves. As a bonus, you could offer to babysit their children and do tasks around the house while she takes a bath. 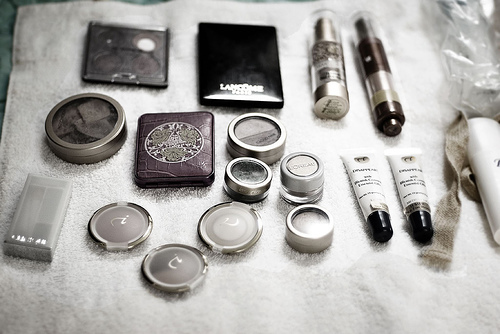 What It Is: A kit or set of cosmetics, often in sample sizes, to create or reproduce a look (e.g. smokey eyes) or offer the same product in multiple colors. Why It's Such a Great Gift: Even if you're not a makeup artist, chances are you can find a kit which will include something flattering for the recipient. Possible Recipients: Women who wear makeup. Impossible Recipients: Women who don't. What It Is: Anything plastic and eye-searing pink. Glitter a plus. Why It's Such a Great Gift: Allows recipient to recapture lost innocence, however fleetingly. Possible Recipients: Riot Grrrls, kinderwhores, young children, grown-up children. What It Is: Goop, usually expensive, which hydrates the pores of one's skin. Why It's Such a Great Gift: Moisturizer feels good on the skin, makes it feel smoother and usually smells nice. Possible Recipients: People who like smearing fragrant goop on their bodies. Impossible Recipients: People who like smearing fragrant goop on other people's bodies without necessarily asking them for permission first. What It Is: Sheer or opaque fabric pulled over the legs. Why It's Such a Great Gift: If you're in a cold clime, tights are a great way for your recipient to warm up any outfit. If not, they're nice accessories anyway. Possible Recipients: Women with nice legs, women with ugly legs, Frank'n'furter. Impossible Recipients: Amputees, basket cases.